With summer in full swing, I thought I’d share a few summertime art journaling prompts that can be used to inspire your creativity or to help you capture all those summer memories. This can be a busy time of the year for many people – especially as there are kids who are off from school, vacation and travel plans being made, and of course the warm summer weather! Hopefully these summer creative journaling prompts will help you unwind and enjoy a relaxing summer full of inspiration! Summer Time Creative Prompts for Art Journaling, Writing & More! 1. Favorite summer foods: What foods are special to you in the summer time? 2. What does summer mean to you? Journal the word “summer” across a page and draw/paint/doodle/collage all your favorite things you associate with the summertime season! 3. Favorite summer scents & smells: What scents make you think of summer? 4. Summer Bucket List: What are the top 5 things you want to do this summer? 5. Love & Romance: While there’s no Valentine’s Day, summer is full of romantic moments and memories – also weddings are popular during the summer months! 6. Sunshine: For many of us, summer is the only time we ever get to see the sun! Create a page about soaking up the rays or staying in the shade. 7. Ice Cream: What’s your favorite flavor of ice cream? 8. The Beach: The sand, the waves, the lake/ocean…what do you love/hate about the beach? 10. Ephemera from summer activities: Receipts, ticket stubs, event programs…all of these things make for great ephemera to use in your summer pages. 11. Summer Colors: What colors do you think of when you think “summertime”? Browse summer themed color palettes online to inspire you or choose your own! 12. Summer Quotes: There’s a plethora of quotes about summertime that can be used in your art journals. Good Reads is a good place to start if you need some quotes for your journal. 13. Favorite Summer Memory from Childhood: I know when I was a kid summer was my favorite time of year – no school! Think about what you enjoyed about the summers as a kid and create a page (or two!) about it. 14. Summer Reading List: What books are you reading this summer? You can either create a page that lists the different books or create a page inspired by one of the characters or the story plot. 15. Your Perfect Summer Day: What would you do on your perfect summertime day? 16. Travel Plans: Are you planning to travel anywhere this summer? Make a page about the things you hope to see and do and the places you want to go. 17. Dreams: What did you dream about last night? Not only is this a fun way to express your creativity, it can be a great way to interpret your dreams as well. 18. Favorite Summer Sports: Do you like summertime sports like baseball or picnic games? 19. Create a How-To Guide: What are some of your favorite things to do this time of year? Create a how-to guide in your journal on how to do one of your favorite summer activities. You can use words and/or pictures. 20. Invent a New Summertime Game or Activity: Think of something completely original, or put a different twist on an old favorite. For example, Who’s up for a game of glow-in-the-dark badminton!? 21. Summer Road Trip: Did you go on any road trips this summer (or planning on any?) Create a page about what makes a road trip a good one. 22. Favorite Ways to Cool Down: What do you do when the weather is too hot to do anything? 23. Farmer’s Markets: Do you go to any farmers markets? Make a page of your favorite things about them or use packaging/labels from a Farmer’s Market into a page. 24. Stars & Moon: The summer is a great time to go stargazing- make a page about something related to the stars or moon. 25. Design a Tree House: Who said tree houses are just for kids? Draw/Paint one and journal about it’s special features. 26. Summer Gratitude List: What things are you most thankful for in the summertime? 27. Summer Playlist: Is there a certain type of music you like more in the summer compared to other seasons? Any special songs you like to listen to in the summertime? Use a quote from the lyrics in your page, or make a list of songs. 28. Write a Summer Haiku: Haikus are very simple poems to write (5 syllables the first line, 7 syllables the second, then 5 syllables the third) – write one about summertime and illustrate it. 30. Summer in the City/Country: Do you prefer summertime in the city or the country? Make a page about the signs of summer where you live. 31. Lights Out: What do you do when the power goes out in the summertime? Another fun idea: try art journaling by candlelight. 32. Summer is Not Always Great! What do you dislike about summer? 33. Mid-Year Review: Summer is about halfway through the year – so why not do a mid-year in review of the highlights of the year so far? 34. Observe a Wacky Holiday: Every month is an observance month for something, and there’s a wacky holiday for almost any day of the year. Check out Bizzare Holidays for some inspiration! 35. Boredom Busters: My kids tell me they are bored constantly during the summer months – make a to-do list of boredom busters or things you like to do when you’re bored. 36. Go People Watching: Take an afternoon and sit on a park bench or at a coffee shop and people watch. Sketch the people in your journal or take notes or imagine their story. 37. Favorite Summer Hangouts: Where do you like to visit during the summer? Make a page about your favorite summer hot spots. 38. Create a timeline of the summer so far. Be sure to include who, what, where, and when. 39. Now & Then Page: Create a “summer then” and a “summer now” page. Use photographs or pictures from old & new magazines to show the differences in styles, activities, etc. 40. Family Reunions & Picnics: Create a page about your family members or the last time you all got together. What made it memorable? 41. Staycation: No travel plans this summer? Why not journal about your ideal “staycation” – what you’d like to do around the house or taking a vacation right at home. 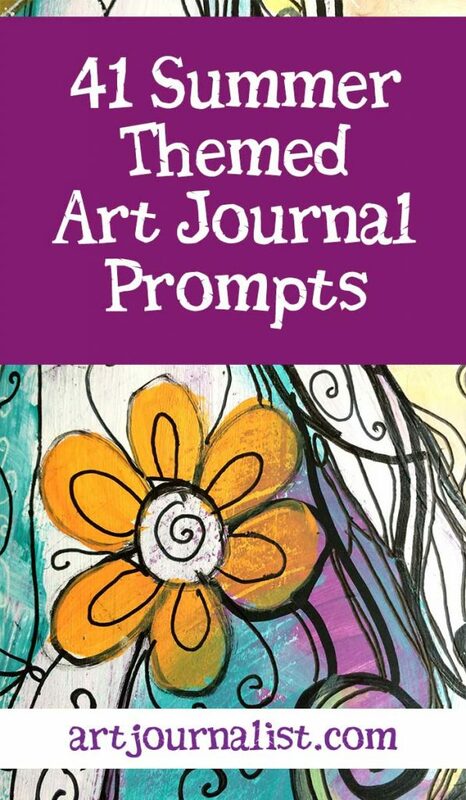 Do you have any ideas for summer art journal prompts? Share them in the comments section below! And if you are inspired to create anything using any of these prompts – I would LOVE to see what you make – join our Facebook group to connect with creatives worldwide! You rock! Keep up this great work! Thanks..nice ideas…I like working with artist masking and watercolor too…any more prompts?? ?